In a first for TiVo, the DVR pioneer is testing a familiar-looking upgrade program. Apple recently offered me $250 for my iPhone 7 in the form of credit off the purchase price of a new iPhone XR. My old phone will be refurbished or responsibly recycled and I get a nice discount on a significant upgrade. And TiVo is essentially implementing the same. Owners of Roamio OTA DVRs (of any capacity) will receive a $200 credit towards a brand-spanking new 1TB Bolt OTA with an all-in, Lifetime service plan. So instead of a $500 invoice ($250 for the box, $250 for the service), cord cutters will pay just $300 out of pocket — which compares favorably, on pricing anyway, to the $280 1TB Amazon Fire TV Recast DVR. As to the mechanics, the packaging your new TiVo arrives in will be used for return shipping (and, yes, they’ll provide a label) and you’ll have 30 days to ship it in, allowing plenty of time to transfer recordings and season passes. Plus you can hang onto your old remote. Bolt OTA is a significant upgrade over Roamio OTA hardware in several ways. There’s a notable improvement in performance, given more powerful processor and additional memory, along with 4K streaming… where applicable (think Netflix app). More notable, for many, is the native streaming and downloading of recordings to iPhone and Android smartphones or tablets. And let’s not forget the very nice voice remote, packed in. The TiVo Holiday Trade-In, Trade-Up sales event is expected to begin the evening of 12/12 and will run through 12/22. Looks like you need a 1TB box to trade in, not any capacity as you state. Unfortunate as I have a 500GB that I’d love to trade in. Well… let’s give it a try when the dealio goes live and see what happens. If I understood correctly, TiVo VP Ted Malone thought it could possibly be included. My Roamio has this via the TiVo app. In home and out of home. Am I missing something? The base Roamio hardware models, including OTA, don’t transcode if memory serves. I assume you have a Pro/Plus model? Yes, a plus. I didn’t realize the reservations without that ability. Hmmm you can still get $300 from trading a Samsung S7 junk. That’s just one of the dozens phones. iPhone isn’t a thing anymore so stop using it like if they are unique in trading anything better than the competition. I used to have a TiVo. Now I have a cheaper Roku box and stream everything with many more options. I haven’t looked back. Can Roamio OTA DVR record Hulu TV channels? I am thinking of combining local channels with the ones available on Hulu TV. Danny, TiVo provides universal search of television and online content, including some complex ‘OnePass’ indexing and deep linking into online services — but no direct recording of online content. Strykernycc, iPhone was a convenient comparison given my trade a week or so ago. 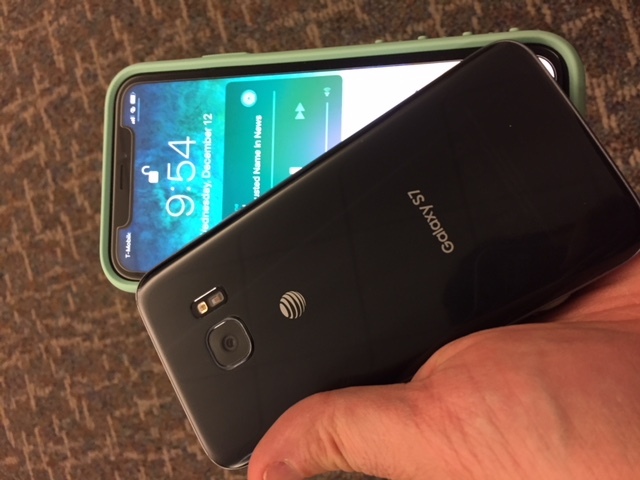 For reference, I just visited the Samsung site and they’re offering me $100 credit for my Galaxy S7 (pictured here with my new iPhone XR). Carriers will often subsidize and inflate trade-ins by paying out your credit over 24-36 months and making it up on the service side. Whereas the TiVo credit and my Apple trade-in are handled on the front-end, not over the course of a couple years. The bottom line here is TiVo is testing what the smartphone industry has been doing to keep folks in the fold and happy on new hardware. Hopefully the results are positive so they consider expanding the program to additional devices and scenarios. I’ll be very curious to see if this work with all Roamio OTA boxes as stated in the article. I bought a $50 Roamio OTA I bought back in 2014 that is a subscription only device. I can’t buy lifetime for it even if I wanted. It’s been sitting in a box since the original year of service ran out 3 years ago. I would love to trade it in. The way I see it, this is just a lifetime transfer for $49, targeted to the Roamio. Most of the boxes they’ve offered the “lifetime transfer” on weren’t eligible for new service — so there was no reason for them to request the box back. ATSC 3.0 will make that traded Bolt useless in a year. Ron, it’s going to be a many year transition with broadcast occurring in both formats whenever they even get started. So these boxes, HDHomeRun, Tablo, television tuners will be fine for quite some time. Dan, mathematically, that’s the extent of it… which exceeds the prior $99 transfer promotions. Also what’s new is the responsible recycling versus tossing older and/or unused hardware down the trash chute. Tivo will reuse what they can and properly dispose of the rest. Sure Ron, everyone is going to get rid of a trillion dollars worth of electronics next year to get broadcast 4K, which only about 50 people are going to care about. Absolutely. OTA only? Cable users pay subscription too. Would be a nice trade up offer, especially for those that bought a bolt with it’s 4 tuner recording. i cant get an ota signal . i live over 90 miles from the tv towers can i trade in my old roamio that can do cable or ota ,Like i said i have to use cable because i cant receive ota signals from los angeles in the high desert where i live. Any indication this offer will include Roamio Plus or Pro? doublejskid, celtic pride, Jeff, it’s just Roamio OTA -> Bolt OTA at this point in time. Hopefully it’s a successful promotion and they consider other permutations. Bet Cable -> OTA would see a little traction. I need 6 tuners; my Roamio has six, the Bolt, if I’m not mistaken, has 4. Linda, if you have six tuners, you do not have the Roamio OTA. OTA models have always maxed out at four. It’s Dec. 13. I don’t see anything on Tivo’s website yet. I have a Roamio OTA (orig. 500, upgraded to 2TB). I’d be interested in the Bolt upgrade, but need to confirm that the 500 is applicable. Ted tells me the page won’t handle the 500GB Roamio OTA… but to call in, they should be able to work it out with you. *IF* the box has Lifetime/All-In service. Roamio OTA units on monthly/annual subscription plans aren’t eligible for the current offer. Bummer. Perhaps it’s time I remove the hard drive from my Roamio OTA and recycle the rest. I will never pay the monthly subscription, and Tivo won’t let me buy lifetime for it, so it’s not much more than e-waste at this point. Well that was a fruitless call to customer service, I have a Roamio OTA 500 GB unit and would like to update. The web site didn’t accept my TSN, and customer service insisted I had a have a 1 TB Roamio, so no luck today. I’ll try again tomorrow and see if the web site accepts ny TSN, good luck. I was just able to get the discount with the TSN of my 500 GB lifetime service plan TIVO. I was just able to get the discount with the TSN of my 500 GB lifetime service plan Roamio OTA. Alan, I had an exchange with Ted. If the site isn’t working for you later today, do you have a Twitter account you could DM him from? He’ll make it right with/for you. His handle is @ted_malone. I can also connect you via email. Update: I tried again this morning and had no issues. I was able to do the trade in successfully. Good thing my Roamio 500 GB has lifetime service. Thanks for the help. I’ve rec’d this offer as well, and later got another email that confirmed either 500GB or 1TB versions are eligible. Do you know when Tivo might re-offer the Lifetime Service Transfer Deal (for older boxes)? 1 of my Tivo HDs (series 3) is so slow transferring that I would now take them up on the $99 transfer deal with buying a new Bolt from Tivo. I called them in late November and they would not offer this deal to me again, even though I have been a Tivo customer for 15yrs and have purchased 6 tivos and 4 minis over the years. I still like Tivo (use to love it), but may consider leaving if they do not offer this $99 xfer deal to me for my Tivo HD or Tivo Humax DVD box (series2 which still works!). I don’t know if it is HDR or something else, but I have a splitter from my antennae so my TV and Tivo both have coax attached. The picture using the TV tuner is quite a bit better than if I change input and watch the same show through the Tivo. I don’t see much difference between streaming Netflix through the TV, and watching it go from 720/1080/2160. But even 720 on the TV tuner looks great on a 65x900f. Hoping if I upgrade to Bolt I will get the same better picture the TV tuner can produce. but yes, OTA/1080 picture on a BOLT is better than same picture on a Roamio.